Jimmy John's opened the doors to their newest, and also their third, Duluth location a few weeks ago at the Shops at BlueStone on Woodland Avenue. The new location features the most current Jimmy John's prototype which had yet to debut within the Twin Ports market. Customers will notice a heavy use of graphics within the store whether it be on the walls or the tables. In fact those tables are fully branded with all the quirky sayings that Jimmy John's is known for. While the new location is on the smaller side regarding size it doesn't feel that with way due to the immense ceiling height. There's also good reason for the smaller size as the Shops at BlueStone location has something the others don't; a drive thru. That's ride, no need to get out of the vehicle now in order to get your favorite sub and of course you still have the ability to tap into their freaky fast delivery. Jimmy John's continues to be on the look out for additional Twin Ports locations including a location near the Miller Hill Mall. We've included some pictures below of the new Jimmy John's location. The Shop at BlueStone's newest retail buildings are filling up and very quickly we might add. What is technically the third phase for the project features five retail spaces in two buildings, four of which have already been leased including two that already are occupied by operating retail businesses. Jimmy John's opened their third Duluth location this past month within the new retail building that abuts next to the first phase of the Shops at BlueStone. In that building Members Cooperative Credit Union opened what is also their third Duluth location last month. The last tenant for the space, Pearl Nails & Spa, will open by May 1st. The second part of this next phase of retail development for BlueStone Commons will feature a building that will house a Pizza Hut and Wing Street location along with an additional tenant that has yet to be confirmed. Developer Mark Lambert is hoping for an asian restaurant of some sort to open within the space. Work continues at the Shops at BlueStone. The building under construction will include a Pizza Hut | Wing Street location along with additional tenant. Now what exactly could be that sought after asian tenant we are not sure. However we do believe that LeeAnn Chin currently is the most logical choice for the space as at the moment the company only has one Duluth location. That location is within the Miller Hill Mall and it is technically a rarity for the company as it is a food court location. There could be a multitude of other asian restaurants including local restaurants that might be looking to expand. 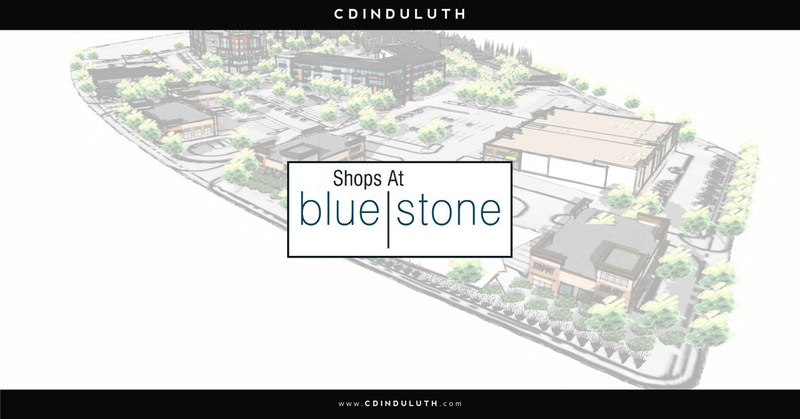 There is still an additional retail phase planned for the BlueStone Commons development that will likely include twice the amount of retail already present on site. The exact plans for that phase have yet to be solidified however original plans did include over 30,000 square feet of retail (the size of a Bed, Bath, and Beyond location). As more details emerge we'll be sure to sure to let you know right here at CDINDULUTH!